As outlined below, an epigraph is a quotation that is pertinent but not integral to the text. It is optional. During the production of emerge, the production team may solicit potential epigraphs from the emerge editorial team members and will create a longlist. The production team will review all submissions and shortlist three epigraphs. These three epigraphs will be voted on within the collective emerge production team. The epigraph with the most votes will be included in the anthology. The production team, in collaboration with the Managing Editor and Publisher, will have final say on the wording of the epigraph. The epigraph appears on p. vii. 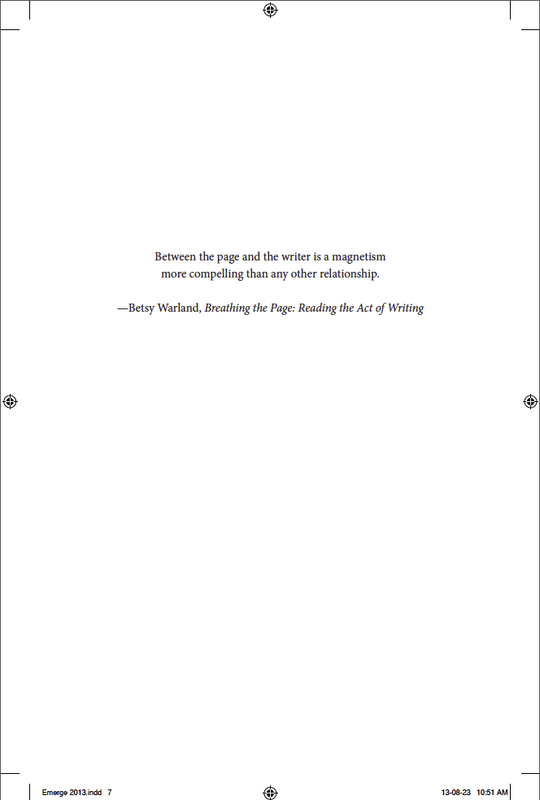 An author may wish to include an epigraph—a quotation that is pertinent but not integral to the text—at the beginning of the book. If there is no dedication, the epigraph may be placed on page v (see 1.4); otherwise, it is usually placed on page vi, opposite the table of contents. Epigraphs are also occasionally used at chapter openings and, more rarely, at the beginnings of sections within chapters. The source of an epigraph is usually given on a line following the quotation, sometimes preceded by a dash (see 13.34). Only the author’s name (in the case of a well-known author, only the last name) and, usually, the title of the work need appear; beyond this, it is customary not to annotate book epigraphs. Click here for CMS Online. let your roots creep forth, gaining strength. Let me live, love, and say it well in good sentences. Between the page and the writer is a magnetism more compelling than any other relationship. emerge: The Writer's Studio Anthology, Blog at WordPress.com.